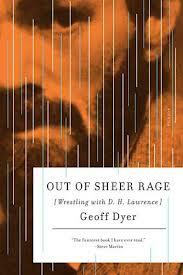 Geoff Dyer’s Out of Sheer Rage [Wrestling with D.H. Lawrence] is just about the best non-study of D.H. Lawrence that I’ve ever read. Not that I’ve read any other non-studies of Lawrence, or any actual Lawrence studies, for that matter. But if you want to read a truly superb non-study of Lawrence, I can’t recommend Out of Sheer Rage highly enough. You will learn some things about Lawrence — but at a slant—and you will learn a world about Geoff Dyer. I’m a big Geoff Dyer fan. Call it a crush if you like. I won’t argue. It’s a literary crush. I find Geoff, as I like to call him, about the best company I can imagine: for entertaining me highly, making me laugh out loud, and most of all, for expressing to a T how life feels, at least to me a lot of the time: the existential angst of it all. Geoff is hilariously human, full of foibles, self-deprecatingly self-aware, with a navel-gazing self-consciousness, a keen intelligence about the human condition, and a love-hate relationship with his best subject, himself. He’s willing to let you in, up close and personal, so that it feels as if you’re his intimate. He’s a mess, and he’s willing to tell you all about it. But he does so with such aplomb, such delicious, sharp, acerbic observations about himself and everything around him, that to read him is to feel truly vindicated in your own human shortcomings. The idea behind Out of Sheer Rage is that Dyer intends to write a serious study of D.H. Lawrence, the writer who most made him want to become a writer. But he keeps procrastinating, and Sheer Rage becomes a painfully comic description of his efforts to get a grip. Looking back it seems, on the one hand, hard to believe that I could have wasted so much time, could have exhausted myself so utterly, wondering when I was going to begin my study of D.H. Lawrence; on the other, it seems equally hard to believe that I ever started it, for the prospect of embarking on this study of Lawrence accelerated and intensified the psychological disarray it was meant to delay and alleviate. Conceived as a distraction, it immediately took on the distracted character of that from which it was intended to be a distraction, namely myself. If, I said to myself, if I can apply myself to a sober—I can remember saying that word ‘sober’ to myself, over and over, until it acquired a hysterical, near-demented ring—if I can apply myself to a sober, academic study of D.H. Lawrence then that will force me to pull myself together. I succeeded in applying myself but what I applied myself to—or so it seems to me now, now that I am lost in the middle of what is already a far cry from the sober academic study I had envisaged—was to pulling apart the thing, the book, that was intended to make me pull myself together. I love this voice, and if you don’t, stay away from Geoff Dyer. He won’t be your cuppa. But he sure is mine. The result is that Dyer ends up writing this very book — Out of Sheer Rage — which never manages to actually be the serious, intended study of Lawrence (though there is much about Lawrence in it, based mainly on his letters; no dazzling critical reading of Women in Love, however; so sorry, WIL scholars). But it is about a lot else, mainly the anxieties, frettings, and grouses of Everyman Dyer. The title comes from a quote of Lawrence’s, regarding his book on Thomas Hardy: “Out of sheer rage I’ve begun my book on Thomas Hardy. It will be about anything but Thomas Hardy I am afraid—queer stuff—but not bad.” The perfect epigraph for and description of Dyer’s own book on Lawrence. Dyer, being Dyer, is initially torn between the Lawrence book and a novel he’d like to write. He spins his wheels trying to decide on the best city to live in. “One of the reasons, in fact, that it was impossible to get started on either the Lawrence book or the novel was because I was so preoccupied with where to live. I could live anywhere, all I had to do was choose—but it was impossible to choose because I could live anywhere.” How he can make this hand-wringing at his own expense so amusing I don’t know, but I find it hilarious. ‘This is paradise,’ I said to Laura, sitting on the terrace, surrounded by sea and sky. ‘I wish we were going to be here for six months.’ Then, after a week, even a fortnight seemed intolerable. Except for looking at the brochure-blue sea and sky—which, after the first couple of days, we scarcely even noticed—there was nothing to do and for that reason it was impossible to get any work done. He realizes that anywhere is better for getting work done than wherever he actually is. In an effort to jump-start the book (and himself), he travels to sites where Lawrence lived — Italy, New Mexico, England, Oaxaca. He reads Lawrence’s letters, which he prefers to his novels, studies photographs of Lawrence, visits houses where he lived, and manages to include a lot about Lawrence without ever actually getting down to writing about him, supposedly. What a sleight of hand! I actually found a good bit of the Lawrence material a bit boring. Being me, I was always eager to get back to Dyer—his irritations, complaints, procrastinations, indecisiveness, and writer’s block. Then, at some point, I realized that Dyer was subtly imitating or mimicking Lawrence, which added another clever layer. Lawrence too was ill-tempered, indecisive, full of contradictory impulses—“Has anyone ever been more sensitive to the ebb and flow of their own feelings?” Dyer asks about Lawrence. The answer could be Dyer himself. The book takes a darker turn towards the end. I’ll be glad that this little book turned out how it did because I will see that what was intended to be a sober, academic study of D.H. Lawrence had to become a case history. Not a history of how I recovered from a breakdown but of how breaking down became a means of continuing. Anyone can have a breakdown, anyone. The trick is to have a breakdown and take it in one’s stride. Ideally one would get to the stage where one had a total nervous breakdown and didn’t even notice. What befalls Dyer, after a disastrous trip to Oaxaca, is that he becomes indifferent to everything, falling into a deep depression when he returns to Rome. It [the depression] went on for a couple of months. Laura went to work while I stayed home and did nothing. I read nothing and did nothing. I spent most of the time watching TV which may not sound so extreme but this was mornings and afternoons, it was Italian TV and—the clincher—the TV wasn’t even turned on. Nothing interested me—and this, in the end, is what saved me. I had no interest in anything, no curiosity. All I felt was: I am depressed, I am depressed. And then, this depression generated its own flicker of recovery. I became interested in depression. This struck me as pure Dyer. His mind is so active, his curiosity about the world so intense, that he naturally can’t help becoming interested in the condition of depression. (He’s the author of books on wide-ranging subjects: jazz, photography, travel, the First World War, as well as essays and novels) He began reading books like Darkness Visible about depression, and gradually he came around. He became interested in the world again. “Before I knew it I was overrun with things that interested me.” Not only that, “I began to take pleasure again in the knowledge that there were things, like the theatre, that I had no interest in.” ha.
. . . since the only way to avoid giving into depression and despair is to do something, even something you hate, anything in fact, I force myself to keep bashing away at something, anything. Flaubert said it was only thanks to work that he was ‘able to stifle the melancholy’ he was born with. It is a simple choice: work or succumb to melancholia, depression and despair. Like it or not you have to try to do something with your life, you have to keep plugging away. And there you have it. One way or another we all have to write our studies of D.H. Lawrence. Even if they will never be published, even if we will never complete them, even if all we are left with after years and years of effort is an unfinished, unfinishable record of how we failed to live up to our own earlier ambitions, still we all have to try to make some progress with our books about D. H. Lawrence. Now, if you’ll excuse me, I have to get back to my own book on D. H. Lawrence. I love Dyer, too. Thanks for this. I'm glad to know I have company! I might read "But Beautiful" next — have you read it? But really, I should read someone else. I posted on his great novel "Jeff in Venice, Death in Varanasi," in case you're interested (or maybe you read it — the novel or the post). Thanks for writing in, Diane. Wonderful reflections, Richard. So glad you're a Dyer fan too. So is my husband and we read passages aloud to each other and laugh out loud. Jeff just read "Yoga for People Who Can't Be Bothered to Do It" — such a great Dyer title, huh! Dyer may whine about never getting anything done, being lazy, unable to write — but the guy has really PRODUCED. What an interesting idea about the book being a metaphor for art itself. It's not too late for you to post on Dyer. I'd love to read that, Richard. Thanks for commenting.